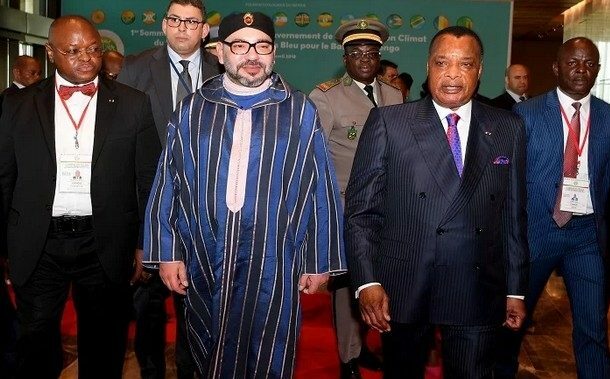 Morocco and the Republic of the Congo Monday signed 14 cooperation agreements during a ceremony in Brazzaville, held under the chairmanship of King Mohammed VI and Congo’s President Denis Sassou N’Guesso. The agreements were signed during the King’s friendship and working visit to Brazzaville, where he had attended on Sunday the first Summit of Heads of State & Government of Climate Commission of Congo Basin and Blue Fund for Congo Basin. The 14 cooperation agreements cover several fields including the promotion and reciprocal protection of investments, non-double taxation and tax evasion prevention. Several other agreements signed Monday are meant to upgrade cooperation in the fields of fisheries, aquaculture, fisheries research and management, promotion of small-scale and traditional fishing, processing and marketing of fishery products, and the fight against illegal, unregulated and unreported fishing. Another important framework agreement on energy provides for enhancing cooperation between the two countries in the fields of electricity through the exchange of expertise and technical assistance in rural electrification matters, organization of internships and training cycles, and encouraging private operators to invest in renewable energies. Other agreements cover the sectors of mining, agriculture and livestock, primary, secondary and literacy education, logistics and Health. The King’s visit to Brazzaville, his second in the Republic of the Congo since his coming to power in 1999, was also marked by tête-à-tête talks with President Sassou N’guesso and by the launch of the construction works of a fishing landing site worth 30 million dirhams in the Yoro Port. The fishing project translates the Monarch’s unwavering commitment to the development of the continent, in the framework of South-South cooperation and acting solidarity. It gives substance to the African strategy the Moroccan King has been spearheading for years in a bid to promote a human, sustainable and integrated development. The project also reflects the King’s willingness to improve the living conditions of African citizens and fight poverty and precariousness. Congo is Morocco’s seventh-largest customer in sub-Saharan Africa. 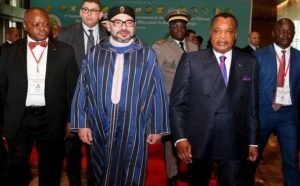 King Mohammed VI was accompanied by a large delegation including his advisors, Fouad Ali El Himma and Yassir Zenagui, the Foreign Minister Nasser Bourita, the Minister of Agriculture Aziz Akhennouch and other cabinet members. Posted by Hafid El Fassy on April 30, 2018. Filed under Business, News, Zoom. You can follow any responses to this entry through the RSS 2.0. Both comments and pings are currently closed.